Los Yerberos was and will forever be an important band in Mexico's Reggae scene. They were the first and only Mexican reggae band signed by a multinational music label, BMG – Ariola. The band performed throughout the Mexican republic for more than ten years and produced a total of four albums between 1992 and 2002. In 2006, Mariano Spindola tried to reunite Los Yerberos using further knowledge gained from new musical experiences. On a very beautiful night in 2007, a new, fresh musical style was born, a mixture of CUMBIA with a lot of different colours such as FUNK, REGGAETON, ELECTRONIC BEATS, and REGGAE WITH LATIN FLAVOURS added. CUMBIA, an original Colombian rhythm, has established deep roots in Mexico over the last 20 years or more. Adding their own unique style to cumbia, well-known Mexican artists such as Rigo Tovar, Chicoche, Celso Piña and others, have dedicated their lives to nurturing these roots. Now is the time for Mariano Spíndola and his friends from La Sabrosa Sabrosura to join this generation of musicians renewing again this delicious style of dance music. During the first years the band toured around Mexico and started to plan to tour outside the country, until today the band has toured in Thailand, Spain, Germany, Holland, and USA. Up to 2015 the band has produced independently 5 albums. In February 2007 the band released their first album, named Paposauri. 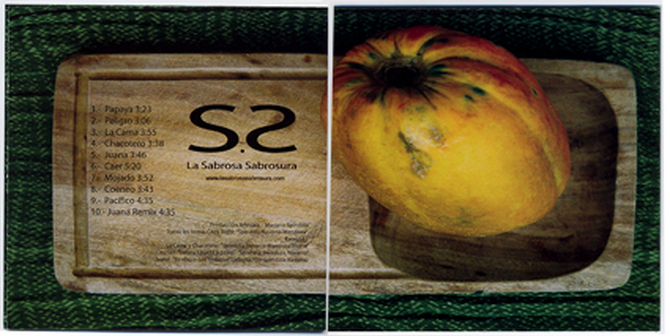 Four of the last six members from Los Yerberos recorded this project. During 2008’s winter and 2009’s spring the second album was produced and released on the summe time of the same year. After the succesfull tour around Thailand the band dicided to print all those wonderfull adventures and experiences, reason why they spent three months in the studio recording their latest pruduction. To release this album they took another challenge, tour around europe, with their dreams, experience and luck in a sack. 3 new songs, 2 old songs that never were released before and 5 remixes of good old themes make these release a very important key to open the doors of USA scene. For the very first time the band release a non original songs album, this time the band produced a very unique versions of a very well know mexican composer who's work is considered one of the most important mexican folk composers of the twentieth century. 20 abril GUAPACHO REVE méxico D.F. ENE 6 clandestino tulum . canibal royal playa del carmen. feb 10 sativa barpto morelos. FORO HILVANA - México D.F. CENTENARIO 107 - México D.F. FESTIVAL POR LA MADRE TIERRA - México D.F. Tras dos años de desarrollo constante y giras alrededor de la républica mexicana, ya como una banda poderosa y consumada, decidieron expandir sus horizontes y vivir una loca aventura en Asia, específicamente Tailandia. En Asia, La Sabrosa Sabrosura obtuvo reconocimiento inesperado, aceptación de una gran audiencia cosmopolita por todo Tailandia y la oportunidad de compartir el escenario con extraordinarios músicos. Feb 6 Bar La Galería D.F. Feb 24 Bar Mexinaco D.F. Mar 14 Festival de San Pedro S.L.P. Mar 21 Festival de Primavera Taxo Gro. Mar 27 PH La Papaya D.F. Abr 16 Rockotitlán Fest, Zócalo D.F. Dic 20 El Nopal Bar. San Pedro, S.L.P.